Smacksy Satuday Photo: My In-House Pastry Chef - . "Okay, Mom. You can look now. 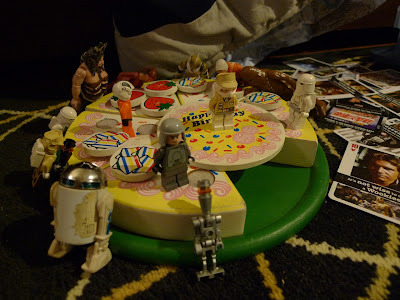 I know you like Star Wars a lot so I made you this Star Wars cake to get ready for your birthday and it's wood so you won't be allergic to it because wood doesn't have wheat in it and so, ready Mom? May The Cake be with you! Get it? Like The Force? May The Cake be with you!" I fear that many cakes are still with me which is why I can't wear my jeans. But a wooden one? Perfect! Happy birthday-to-come, dear Mother Of Bob. What a sweet little man, I'm betting he'll be the kind of guy that won't forget his date is lactose intolerant or her birthday...good job mama! Having fun. Wish I was here. Smacksy Saturday Photo: Star Ship or ATAT?